Teams must play a minimum of three (3) full innings for a game to count as official. If the Home team is leading the Away Team when time runs out or the game is rained out and the Away Team has kicked at least three times the game is official. In Pool and Elimination Games if a team is leading by 10 or more runs after the team that is losing has kicked a minimum of three times and at least as many times as the winning team the game is over. No team has the option to continue. There is a cap of a 12 run margin in the victory, ie if a team wins 19-4, the victory will revert to a 16-4 score so that no team can take advantage of a large margin of victory in one game. After two innings of KC Overtime if it is still a tie an accuracy kick will be used to decide the winner. Accuracy kick is one round with one player of each team kicking and one practice. Higher seed chooses to go first or last in accuracy kick. Each team is allowed two total substitutions. The substitute must be of the same gender as the player they substitute for. Defensive substitutions are free and do not count toward the two subs when the player(s) come from the kicking lineup. A defensive substitution that comes from the bench counts toward the total subs. Offensive substitutions must come from the bench and will count toward the total subs. If there are no subs left on the bench a player cannot be substituted out of the kicking lineup. If an injury occurs see injury substitutions. Base Runner substitutions must first come from the bench and will count toward the total subs. If a sub comes from the lineup it must be the last out of the same gender. The subbed player is out of the game and if that players spot comes up again it is an out. If an injury occurs see injury substitutions. Injury substitutions must first come from the bench and will count toward the total subs. If a player is injured in the kicking lineup must be substituted from the bench. If a player is hurt in the act of running and reaches base safely you may use a player from the kicking lineup if there are no subs left on the bench. The sub must be the last player out of the same gender. This counts toward the total subs. Ejected players can only be substituted from the bench in the kicking lineup and count toward the two sub total. If there are no subs left an out is recorded in that players spot in the kicking lineup. Tie Breakers (Pool Play) - Wins are two points, ties are one point, loses are zero points. First tiebreaker is total points. Second tie breaker is head to head if all teams have played each other. Third tie breaker is Runs Against. Forth tie breaker is Runs For. Last tie breaker is accuracy kick. Referee Disputes - Only team captains may air a grievance with the referee. Once the referee says the decision is final, the discussion concludes and play shall continue in a sportsmanlike manor. Final decisions are made by the head ref at the field during the game. All decisions are final. Cleats & Safety - Metal cleats are prohibited as are any other sharp or unsafe objects or articles of clothing. Foul Ball - A fair fly ball will be judged according to the relative position of the ball and the foul line when it is touched or hits the ground, whichever occurs first. Dead Ball - A ball hitting an inanimate object or referee is not a dead ball unless the ball is hindered in some way such as by equipment, spectators or the other team etc. Dead balls are completely in the judgment of the referees. Dead Play - Play is considered dead when the ball is in control by the pitcher anywhere on the pitching mound. If at that point play is still live, runners may continue to the base they are running to at their own risk. The runner will be returned to the previous base if they stop their forward motion at any time. Strike Zone -Any part of the ball within the strike zone constitutes a strike. The strike zone is: One (1) foot to all sides of the edge of the plate and One (1) foot in height until the pitched ball reaches the kicker in the kicking box. The ball must bounce twice before home plate otherwise it is a ball unless the kicker attempts a kick. Kicker's Count - 3 fouls is an out, 3 strikes is an out & 4 balls is a walk. Fouls & strikes are separate counts and do not combine. Intentional Walks: May only be issued after a strike is thrown to a kicker. Further pitches do not need to be thrown thereafter to walk the kicker. 4 balls thrown without a strike results in 2 bases for the kicker. All forced runners will move as a result. Offsides/Encroachment - is when any fielder crosses the 1st / 3rd base diagonal line or if the catcher passes the kicker before a pitched ball is kicked. Head Shots - Fielders may throw the ball at a runner to get an out, however if the ball hits the runner on the head or neck, the runner is safe and play is dead at that point with base runners advancing to the base they are headed to. Exception: If a runner is sliding into base, ducking to avoid getting hit, or intentionally uses their head to hit the ball they are out if hit in the neck or head. Kicking Order - All players must kick in the original kicking order which becomes final at the start of the game. Kicking Location - The kick must occur while the entire planted foot is within the kicker's box, i.e. planted foot may not cross the front of the box or plate. Legal Kick - Kicks may be made with any part of the leg below the waist; (knee kicks are allowed). Kicks above the waist are considered a foul and an out, if caught. 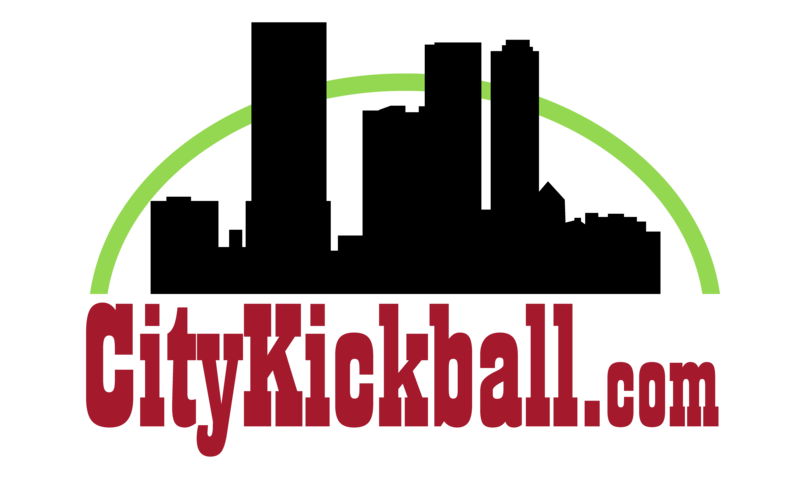 Double Kick - A ball touched more than once by the kicker is a (double kick). If a double kick occurs in fair territory the kicker is out. If a double kick occurs in foul territory it's a foul ball unless caught which results in an out. Bunting - is allowed however the ball must completely cross the front of the kicking box to be considered fair. Safety Base - is an additional base located next to first base on the runners' right in foul territory. Rounding 1st Base - Any runner that makes a deliberate or aggressive action towards 2nd base may be tagged out after safely passing 1st base. Overthrows - Is when a ball thrown or kicked by a fielder travels into foul territory behind 1st, 3rd or home plate. Tagging Up - Runners must tag up for balls caught in fair or foul territory. If the ball is 1st touched in foul territory but not caught, it remains a foul ball and runners cannot advance. Runners may advance once the fielder makes initial contact with a caught ball. Force Outs: 2 runners may not occupy the same base. Baseline - The Baseline is 3 feet to either side in a straight line from the runner to the base they are attempting to reach and is only established when a ball tag attempt occurs. Leading and stealing - are not allowed. Referees may warn a player that he/she is acting in an unsportsmanlike manner. After an initial warning a player may be removed for that game. The head tournament referee and/or tourney staff may remove that player for the rest of the tournament if it is recommended by the game head referee.